The first day of school after Spring Break is always busy, but for Garden Oaks Montessori students and staff, the day was marked with even more excitement thanks to the opening of new building additions. Teachers worked through Spring Break to ensure classrooms were ready for students, while some parents even stopped by last week to give their children a chance to get acclimated early. This entry was posted in 2012 bond, 21st century schools, District I - Elizabeth Santos, HISD: Our Story and tagged 2012 bond, Garden Oaks Montessori on March 19, 2018 by HISD Communications. The Garden Oaks Montessori campus will be buzzing with activity over spring break, as construction wraps up on two additions and crews work to ensure the buildings are ready to welcome students on March 19. This entry was posted in 2012 bond, 21st century schools, District I - Elizabeth Santos and tagged 2012 bond, Garden Oaks Montessori on March 1, 2018 by HISD Communications. Construction of two new buildings at Garden Oaks Montessori is nearing the finish line as both structures, as well as the first phase of campus renovations, are scheduled to be complete next quarter. In the new buildings, external masonry and metal panels have been installed, as have most windows. All interior walls have been inspected and now are being insulated and covered. Much of the remaining work will focus on interior finishes, including installation of ceiling panels, drywall, doors, and other built-ins. This entry was posted in 2012 bond, 21st century schools, District I - Elizabeth Santos, Elementary Schools, New schools and tagged 2012 bond, BuildHISD, Garden Oaks, Garden Oaks Elementary School, Garden Oaks ES, Garden Oaks K-8, Garden Oaks Montessori on December 13, 2017 by HISD Communications. Construction at Garden Oaks Montessori is gaining ground as the school’s two new building additions are more than a quarter of the way complete and renovations to the existing building are underway. The construction of the two new additions are a key feature of the $26.7 million project, which is part of the HISD voter-approved 2012 Bond Program. Roof installation is complete on the two-story addition, which is being outfitted with doors and windows. On the three-story addition, steel work is complete and roofing is underway. Renovations to the library and installation of the steel framing for the cafeteria expansion also are underway, and the new circle drive is halfway done. 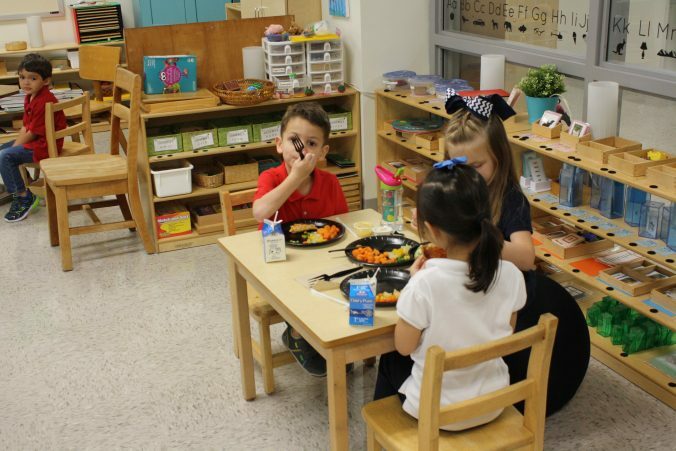 This entry was posted in 2012 bond, 21st century schools, District I - Elizabeth Santos, News and tagged 2012 bond, BuildHISD, Garden Oaks K-8, Garden Oaks Montessori on August 9, 2017 by HISD Communications. Despite a stormy forecast, the weather cleared up just long enough Friday morning for the Garden Oaks Montessori community to officially celebrate the start of construction on their new addition and renovations. The suddenly sunny skies matched the mood of hundreds of students, staff, and community members who took part in the groundbreaking ceremony. “We have some sunlight, so let’s make the most of this beautiful moment in time,” Principal Lindsey Pollock said as she kicked off the celebration, which included student performances and a recitation of the Garden Oaks Creed. This entry was posted in 2012 bond, 21st century schools, District I - Elizabeth Santos, Elementary Schools, New schools, News, Special events and tagged 2012 bond, BuildHISD, Garden Oaks, Garden Oaks Elementary School, Garden Oaks ES, Garden Oaks K-8, Garden Oaks Montessori on February 17, 2017 by HISD Communications. The Orange Show’s 29th annual Art Car Parade will be rolling through downtown Houston on Saturday, April 9, and almost a dozen of the mobile artworks on display will be the work of HISD students. This entry was posted in Art, District I - Elizabeth Santos, District II - Rhonda Skillern Jones, District V - Sue Deigaard, District VII - Anne Sung, News, Special events and tagged AIMS, art car, Black MS, Davis HS, Forest Brook MS, Garden Oaks Montessori, Hamilton MS, Herod ES, Hogg Ms, Liberty HS, Lovett ES, Reagan HS on April 6, 2016 by HISD Communications.